Dr. Martin Luther King Jr. was born 90 years ago this month. 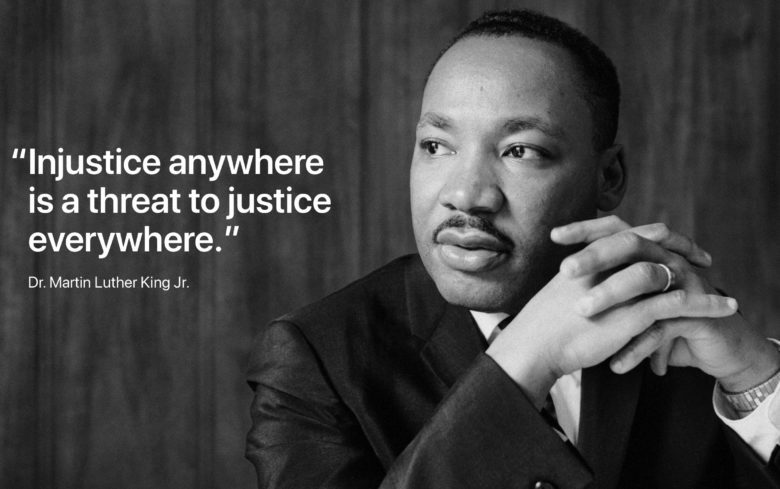 Apple has commemorated Dr. Martin Luther King Jr. Day by changing the image on its homepage to showcase a quote from the legendary civil rights leader. “Injustice anywhere is a threat to justice everywhere,” reads the quotation. It is accompanied by a photograph of the iconic minister who was born 90 years ago this month. Tim Cook also paid homage to King on Twitter. Tim Cook has frequently spoken about King being a personal hero to him. In his office at Apple, Cook has revealed that there is a photo of Martin Luther King on display, in addition to images of Robert Kennedy. The U.S. celebrates King’s birthday each year with a national holiday on the third Monday of January. Apple has previously offered a special gift-matching promotion for the day, donating $50 for every voluntary hour worked by employees. It also allows employees to take that day as a holiday.